I don’t know about you, but the way I see it, the iPad is mainly to be used for playing that awesome game called Flight Control HD. (Try it once, and I’ll bet my bottom dollar that you will not want to stop landing those planes!) It also is a great e-book reader, and of course, one can’t forget the angry birds and the irritating green pigs. If you were the band Gorillaz, though, you’d find something a little more productive to do on the iPad – such as record an entire album! The British group has never been on any of my playlists, but I am inclined to try out their new album simply because of this fact. Dubbed “The Fall”, the album was created simply by utilizing some iPad applications – a plethora of which is available. Some of these applications are Speak It!, SoundyThingie, Mugician, and Solo Synth. Before you write this one off, watch the video of the first track in the album. 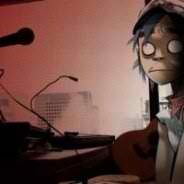 You just might become a Gorillaz convert if you do! Here’s another cool thing – the entire album can be downloaded for free at the Gorillaz’s web site. As long as you sign up for the newsletter, you can get your hands on this one of a kind production. Next year, the CD will go on sale, but why wait for that?